Shrimp club sandwich comes from America. These are sandwiches made from toast bread, prepared poultry fillet or bacon plus tomato slices, iceberg lettuce, and mayonnaise-like sauce. They were first filed back in the late 19th century in one of the clubs in New York. We are not in the USA, and we have our own view on sandwiches. This dish is perfect for parties. It can be made initially portioned or, if necessary, cut into pieces. 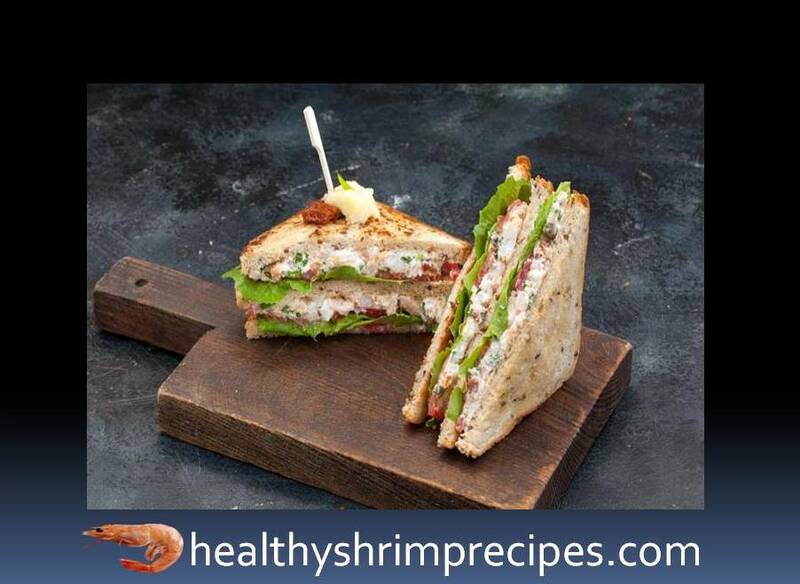 Shrimp club sandwich dish bread is very important. It should be leavened, gruff, with a hard crust. The normal loaf will not work. More precisely fit, but the taste and effect will not be the same. The second important point is that guests should serve immediately after preparation, as the bread is richly saturated with sauce and quickly soaked. #Step – 1 Cut each shrimp in half lengthwise. #Step – 2 Throw mussels on a sieve, shift to a board and chop quite large. #Step – 3 Chop the green onion very thinly. Mix it with soft cream cheese, gradually, continuing to mix, add capelin caviar. You should have a homogeneous mass. #Step – 4 Cut the tomato into thin circles, adds a little salt and pepper generously. Grease 4 slices of bread with caviar and cheese mass. #Step – 5 Place either shrimp or mussels on each greased piece. Put tomatoes on seafood, lettuce on tomatoes. #Step – 6 Collect sandwiches by stacking 2 slices of bread with the filling on top of each other and closing with the third “empty” piece. Slightly press sandwiches so that the layers do not fall apart. Pierce each from the two opposite corners with the skewers and cut diagonally into two triangular pieces.